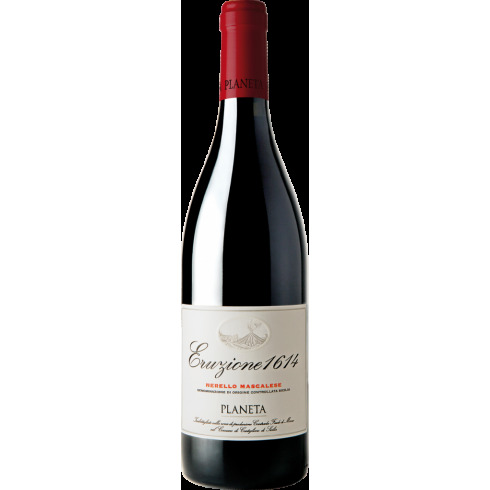 Planeta Eruzione 1614 Nerello Mascalese On offer here | Saporidoc UK. Eruzione 1614 Nerello Mascalese from the famous and innovative Sicilian top producer Planeta. A wine taking its name from the historic eruption which has shaped the soil in which the vines grow – namely the legendary 1614 eruption which lasted for ten years. A Nerello Mascalese redwine with an elegant style, refined and balanced. Maturation In oak barrels for 12 months. Taste A light almost salty touch, the tannins are of compact texture extracted with elegance. Pairs with Game, dishes with truffles, fish with complex sauces, cheese and salamis. Serving temperature 16-18 C.
The Nerello Mascalese vines for the Eruzione 1614 grow in the rich black lava sands in various vineyards at Planta’s Feudo di Mezzo winery on the northern slopes of Mount Etna near Castiglione di Sicilia at altitudes from 510 to 850 m.
The grapes were manually harvested and carefully sorted followed by a soft pressing of the grapes. The must was fermented in stainless steel vats and remained on the skins for 21 days. The wine was matured in oak barrels for 12 months. Taste: A light almost salty touch, the tannins are of compact texture extracted with elegance.